The West must pressure the government of Iraq to free the hostages abducted from Camp Ashraf. On October 28, I joined a cross-party panel at a conference in Church House, Westminster, with dozens of my colleagues from both Houses of Parliament to talk about Iran and what we, in the U.K., can do in the face of appalling atrocities committed by the Iranian regime. At the heart of the conference was the fate of seven Iranian dissidents taken hostage by Iraqi Special Forces. The hostages were abducted following an attack on their home in Camp Ashraf Iraq which left 52 of their friends killed. Several weeks ago, I spoke at a rally in Trafalgar Square on this very issue and I met the hunger strikers from my constituency protesting to bring about the release of the hostages. 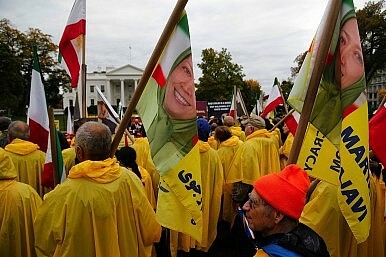 It saddens me that after 68 days their hunger strike for the release of the seven Iranian hostages continues. In fact, they are not alone. Supporters of a free Iran, their friends and family in Camp Liberty and in other cities around the world are also on hunger strike. I commend the resolve of the hunger strikers and I admire their discipline and determination. They deserve every appreciation and recognition for paying a physical price for the freedom of the Iranian people and members of the Iranian opposition who are being persecuted, threatened and killed by the Iranian regime and its proxies in Iraq. Since 2009 and much before, many parliamentarians in the U.K., Europe and the U.S. have consistently and persistently warned that the Nouri al-Maliki government in Iraq is dependent heavily on the Iranian regime next door for political, financial and military support. This allegiance to the Iranian regime made his government not only unwilling but incapable of protecting this group of Iranians in Iraq. At the behest of the Iranian regime, what happened in Camp Ashraf on September 1 was nothing short of a crime against humanity and the culprits must be brought to justice. We all know that it is futile to ask a perpetrator of a crime to investigate that very same crime. So Iraq must have nothing to do with any investigation into the massacre. Instead, I and my colleagues from both Houses of Parliament have previously and again call for an independent international investigative team to embark on a fact finding mission and to report their findings to the international community. On the plight of the seven Iranian dissidents taken hostage, it is irrefutable that they were abducted from Camp Ashraf on September 1. As the EU Foreign Policy Chief, Baroness Ashton has said, there is reason to believe that these hostages, including six women, are being held near Baghdad and are in danger of being handed over to Iran where they will face harsh treatment and possibly death at the hands of the Iranian regime for their opposition to the ruling Ayatollahs. The international community, where the U.K. has a strong voice and great influence, must honor the 52 Iranian asylum-seekers who were murdered on September 1 by ensuring that the seven hostages are released immediately. The government of Iraq must not be allowed to act with impunity. The UN, the EU, the U.S. and our government must pressure the government of Iraq until it releases the seven hostages. Further, the UN must put blue helmets on the ground at Camp Liberty and the U.S. must honor its obligations to the residents of Camp Liberty by sending a monitoring team there as a matter of urgency. Our government should use the U.K.'s strong international voice to assist the U.S. and the UN in that direction. The security of the residents of Camp Liberty must be guaranteed by the international community if another massacre is to be prevented. Democratic change in Iran is possible. However, for this to occur we must support the democratic forces. No more important a stage is there for this than at Camp Liberty where we have a duty to protect a group of Iranians whose sole aim is to bring the democracy that we enjoy in the U.K. to the streets of Iran. Dr Matthew Offord is Conservative MP for Hendon in the UK House of Commons and member of the British Parliamentary Committee for Iran Freedom (BPCIF).